Blue de la Cour has her life planned: hide the magic in her blood and continue trying to turn metal into gold so she can help her city’s homeless. But when her father is murdered and a cruel but powerful woman claims custody of Blue and her property, one wrong move could expose her—and doom her once and for all. The only one who can help? The boy she’s loathed since childhood: Prince Kellan. Kellan Renard, crown prince of Balavata, is walking a thin line between political success and devastating violence. Newly returned from boarding school, he must find a bride among the kingdom’s head families and announce his betrothal—but escalating tension among the families makes the search nearly impossible. He’s surprised to discover that the one person who makes him feel like he can breathe is Blue, the girl who once ruined all his best adventures. When mysterious forces lead to disappearances throughout Balavata, Blue and Kellan must work together to find the truth. What they discover will lead them to the darkest reaches of the kingdom, and to the most painful moments of their pasts. When romance is forbidden and evil is rising, can Blue save those she loves, even if it costs her everything? Based loosely on the tale of Cinderella, The Blood Spell is the fourth standalone installment for the Ravenspire series of fairytale retellings. On the surface, this book is in the same vein as many a dark YA fantasy. The magic system involves fae, wands, and transmutation; with a refreshingly hefty emphasis on the alchemical. On deeper levels, the story explores themes of grief, guilt, self-sacrifice, negative coping mechanisms, abuse, healing… and even touches on aspects of PTSD and suicidal ideation. This version of Cinderella bears about as much resemblance to the original tale as Redwine’s Snow White retelling. Which is to say… not much resemblance at all. You still get a few key elements—grand ball, glass slippers, mice and pumpkin transfigurations toward the end—but the rest of the content is heavily original. Much like with her take on Snow White, this heroine has a lot more agency than her original namesake. And Kellan (a.k.a Prince Charming) IS indeed charming… but it’s all a diplomatic façade. This reader is a big fan of a slow burn romance, particularly a rivals-to-friends-to-lovers transition. The Blood Spell handles this romantic aspect incredibly well—helped by the fact that the hero and heroine have known each other their entire lives. That pre-established relationship, which then undergoes a few massive redefining moments of empathy and revelation, makes for some truly organic feeling chemistry. At times, the worldbuilding felt a touch contrived. While it helps to have read a few others in this series to get a feel for the range of magical influences across kingdoms, there were still a number of times that supranatural things occurred without prior allusion to them being possible. Note: I mean this largely in regard to the Blood Wraith and its abilities—as the alchemy side of things was given a good bit of example and foreshadowing. When Hansel and Gretel put in a welcome appearance (and when do we get THEIR story, by the way?!) I expected their expertise to lend more insight to the Wraith’s strengths, weaknesses, and limitations. But their knowledge and advice didn’t seem to add quite enough to the equation. And sadly, the mysterious siblings don’t make a reappearance. Readers will likely appreciate how well rounded most of the peripheral characters end up feeling. A solid investment is made into fleshing out Blue’s father and grandmother, Kellan’s mother, and even some of Kellan’s would-be bride options. Princess Nessa, Kellan’s mute-yet-sassy younger sister, was easily my favorite side character addition. I sincerely hope she will get her own book or novella at some point in the future. 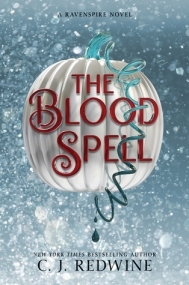 If you’re a fan of inventive retellings, triumph after tragedy, and snappy verbal sparring between love interests, The Blood Spell may be right up your alley.